During the past few weeks, I have been testing out and “kicking the tires”, on Grass Valley’s Edius 6. Edius was originally created by Canopus, and was bought out by Grass Valley. They have continued to improve upon its structure providing a large selection of codec support. 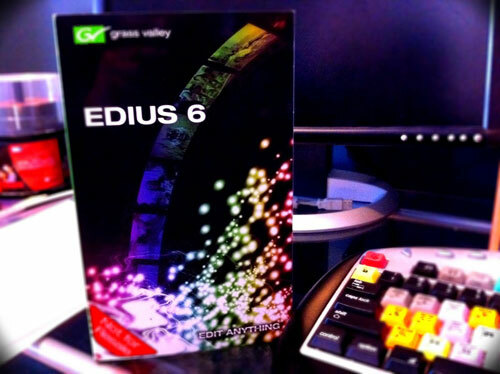 Before I dive into my review, I would like to thank Grass Valley for graciously providing me with this copy of Edius 6. (Note: This version of Edius 6 is a PC version.) Initial installation was simple enough, using the provided CD with an .exe file. A surprise in the packaging was the inclusion of the USB key. This USB key is similar to Avid’s dongle for security. Basically what this means, Eduis will not run without the USB key plugged into the machine. The key must be plugged in before launching the application or nothing will work. A nice security feature when editing on several machines, I will go into that later. The software comes bundled with a large collection of goodies. Some of these include NEWBlue Video Filters, which is specifically, designed for Edius 6. ProDad video effects along with image stabilization for those unsteady shots. Isotope VST audio plug-ins: Audio Effects Suite, AudioRestore, AGC & Mastering Effects Suite, for all your audio mastering needs. However, a surprising nice feature was the Mercalli “Anti – Rolling Shutter” feature that’s seems to work quite well. Simply apply the effect and render to view your results, similar to the one found recently in Apple’s iMovie but with much better results. Edius 6 has several workflow suggestions. However, the one I found to be extremely useful was the proxy mode. When cutting on my desktop, I can transfer the edit to my laptop, via export proxy. This is perfect for an offline edit, or mobility. Once the offline has been completed. I can return to my desktop and re–import the edit back into the desktop for full online editing. This is a very nice feature to have, and can even be used to wrap up projects while away on a trip. Edius also supports 10 bit 2K and 4k files. This means you can also edit RED files with this software. But before you can do so, you need the REDCINE-X tool to import and export the clips. This workflow is similar to transcoding footage using the popular Mpeg Stream Clip. Edius 6 is a great NLE tool for post-production. Grass Valley has continued to up the ante with every new update. The ability to edit mixed formats, and frame rates with out having to transcode is outstanding. Anyone with a Canon 5D or 7D, would be happy with that simple fact alone. The proxy mode is fantastic and can be implemented from single edit suites to post-production houses. Grass Valley also bundles a great set of plug-ins and filters to use along with Edius 6, making it even more appealing to editors and post-production facilities. Grass Valley also provides you with an opportunity to download a 30 day trial, for those of you interested in using this robust software. Edius has come along way in terms of offering solutions for editors working with various formats. It truly does “Edit Anything”.